Info "Hit the board with your dart. But don't actually throw the Form Baton. That will only end in tears." Object D'Art is one of Kat and Ana’s Microgames in WarioWare: Smooth Moves. The term "object d'art" is French, meaning "object of art", but is often used in English to refer to something that is a work of art that is small in size. 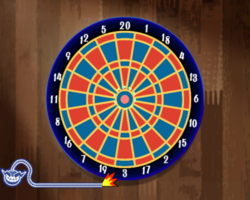 The player must throw the dart anywhere on the dartboard. Getting a bullseye results in the dartboard being lit up. 1st level difficulty: The dartboard is big. 2nd level difficulty: The dartboard is smaller. 3rd level difficulty: The dartboard is at its smallest. This page was last edited on February 19, 2018, at 17:44.